Dirk Kuyt, Holland’s heroically-unfashionable workhorse, says his team will relish the ‘hostility’ of today’s semi-final against Argentina (kick-off 5pm). Kuyt has won his 100th cap while on duty in Brazil — joining an elite seven-man group in Dutch football — despite a perception that he is inferior to more asethetically pleasing team-mates like Wesley Sneijder and Arjen Robben. It’s more than a little unfair, of course, with his versatility and tactical awaresness making him a crucial cog in the current team. But, arguably, it’s his attitude to the challenge that makes him so valuable to Louis Van Gaal’s side. “I think it’s a great tournament so far,” Kuyt told the media in the match build-up. “The football, the atmosphere in Brazil, the brilliant games and the way we won the duels: beautiful. Argentina will be without one of their star names, with Real Madrid’s Angel Di Maria sustaining a thigh injury in the quarter-final win over Belgium. The team’s lynchpin, Javier Mascherano, though, says the players are relishing their first semi-final in 24 years. 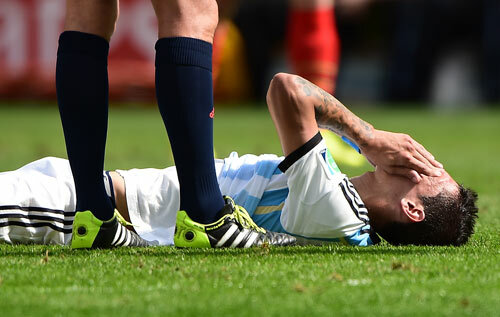 The tournament has already given one Argentina player his chance of redemption. Martín Demichelis has had his share of national team heartache and was widely mocked during a tricky start to his Man City career. The season ended well, with a Premier League title in his pocket, and now, from being a surprise call-up, he has helped his country into the semis.